Lachy was recommended to me from a friend for a renovation in Collins Street, Mt Lofty. I have experienced many builds and renovations in my time and I was pleasantly surprised with the communication and ethic Lachy showed in his work. The renovation was on time and budget, something unheard of whilst dealing with other builders. I genuinely look forward to working together with Lachy on the next project. If I were to sum up the experience in one word I would say it would be trust. We are so pleased with our renovation. Lachlan's dedication and attention to detail is a credit to him. Lachlan's staff are courteous and clean and a pleasure to work with. We were very happy with the quality of workmanship provided by the team at Gray Homes. Lachie and the boys were always patient and professional to deal with and have delivered a home we'll be happy living in for many years to come. Our experience with Lachlan and the guys from Gray homes has been first class, as they not only listened to what we wanted to achieve but came up with positive and constructive ways to improve the building outcomes. The team at Gray homes were also great to get along with and they really enjoyed doing the work which was reflected in the high quality of their workmanship. Lachlan and the guys from Gray Homes helped make my home renovations easy and stress free. Everything ran smoothly and Lachlan kept me informed of the progress through the entire build. Their attention to detail is commended and I was delighted with the outcome." We were recommended to Gray Homes to do our house renovations and additions in 2015. From concept design through to completion of work, we were always confident that we would be happy with the finished result. Throughout the renovations, our job was handled with care and precision. The choice of subcontractors were well chosen and were managed extremely well. The workmanship of the renovations is the highest quality, the finished job exceeding our expectations. During the build there were no surprises or hidden extras. The job site was always kept clean and tidy, with extra effort made to ensure tiles and glass were protected as trades moved through and did their jobs. We absolutely love our new home and we would highly recommend Gray Homes for any build in the future. We used Lachlan and the team from Gray Homes to construct a new carport and driveway. They were professional from quoting through to completion and we wouldn't hesitate to recommend Gray Homes to others. We found Lachlan and the team at Gray Homes fantastic to be to deal with, their attention to detail was second to none. Nothing was too much hassle and the end result was more than we could have asked for. Lachlan was happy to work with us throughout the build to change details along the way to achieve our desired result. We would have no hesitation in recommending Gray Homes to future prospective clients. Lachlan and his team from Gray Homes did a wonderful job in renovating our Guest House. We found the initial consultation very beneficial as Lachlan explained what could and could not be done referring to his expertise and his knowledge of Council rules. As the work was carried out, we were always impressed with the quality of the job and the character of the various people doing the work. They were always polite and explained the job they were there to do. We would highly recommend Gray Homes to our friends. We initially chose Gray Homes because of the reasonable price but we've been nothing but impressed by both the quality of the work and the efficiency with which the job was completed. With any future renovations I couldn't imagine choosing anyone else and was particularly impressed by the care and consideration given to any changes we requested during the renovation process. We definitely recommend Gray Homes to anyone looking to renovate. Our experience with Gray homes was exceptional- Lachlan is very professional and was a pleasure to do business with him. With Gray homes you get great attention to detail and high quality craftsmanship. We highly recommend him and will definitely be calling him again for our next home improvement. Gray Homes recently constructed an extension to our home and we are extremely pleased with the high quality of detail and workmanship. Lachlan demonstrates a willingness to discuss a range of options during the planning stages and commits to his work with a quiet efficiency and professionalism. We have no hesitation in recommending Gray Homes, and would certainly be happy to engage them in future work. 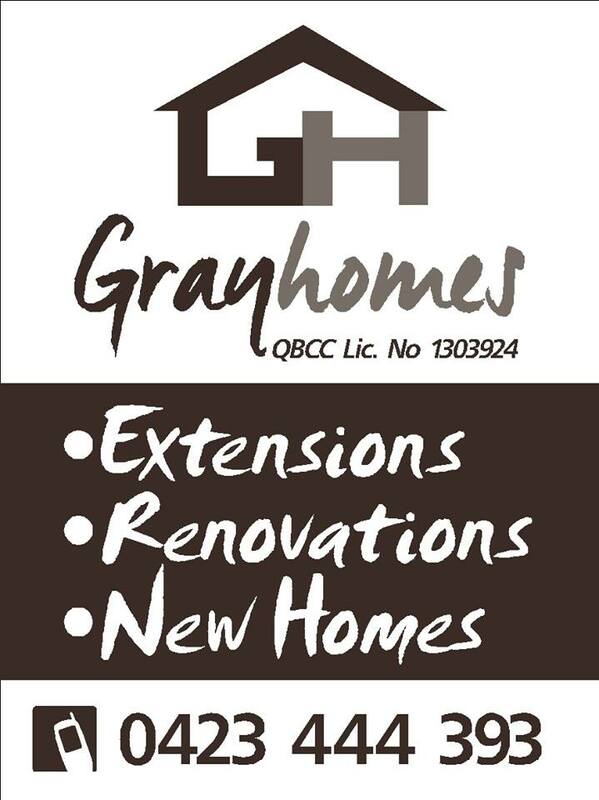 I would recommend Gray Homes for any building and renovation work. Lachlan was available for a consultation and quote, and very flexible when we needed to add work and make adjustments. He made some great suggestions to get the best result, and completed the work to excellent standard in the given timeframe. I am thrilled with the final product. Thanks for your hard work, I am happy to recommend this business to anyone looking for a reliable, honest and affordable builder. I give Gray homes 5 stars! Lachy's workmanship was excellent and I would highly recommend him to anyone looking to have work done on their house. We utilised the services of Lachlan Gray from Gray Homes to create a dining room from an old verandah that was not being used by our family. Lachlan was absolutely professional from the very beginning of the process and consulted us for input the whole way through. No job is too small or too large for Lachlan and Gray Homes have completed several other renovation and cosmetic changes to our property to an extremely high standard. We could not have been happier with the service, reliability and punctuality from Gray Homes. We had Lachlan from Gray Homes perform some repair work on our house, and were thrilled with his efficiency. He is extremely fastidious and his attention to detail was second to none and always cleaned up at the end of each day (with his own cleaning supplies). We really appreciated his reliability and flexibility with our daily routine, always arriving at a time we had agreed on. We intend to use Gray Homes for any future projects and have already recommended them to friends and family. We were fortunate to have Lachy as the foreman on two major renovations carried out at our home when he was employed by a previous builder. It was obvious to us that someone with his skills should progress to his own business. Since venturing out on his own, Lachy has completed three jobs for us and has proved he will be a successful business man. We would recommend Lachlan to anyone looking for a quality builder who has the customers needs at heart. He listens. In dealing with Lachlan Gray you will receive quality workmanship and the pleasure of a relationship with a really good bloke. Lachlan Gray of Gray Homes completed some work for us last year. His very competitive pricing, pride in his work & willingness to offer advice thoroughly impressed us. More than any other builder or tradesman we have ever dealt with, Lachy demonstrated outstanding communication, reliability & project management skills . We will definitely be using Gray Homes again for all our future building needs. I used Lachlan Gray to remove an asbestos wall and fit chamfer boards and later to install a cypress timber floor. Both jobs have a great finish and I was extremely impressed with his workmanship and attention to detail. We loved the flexibility and Lachy’s helpful suggestions about some future projects. I will be using Lachy again and highly recommend Gray Homes you won’t be disappointed. I engaged Gray Homes to undertake insurance rectification works on my home in December 2014. I found Gray Homes reliable, on time, professional and they completed all works to a quality tradesman standard. I would have no hesitation in recommending Gray Homes to carry out any building works. We are extremely happy with the final result of our deck. The quality and professionalism of Gray Homes is second to none. They were in tune with our style and all stages of the renovations were completed in an efficient and timely manner. We would happily recommend their work to others and wouldn't hesitate to acquire their services for future renovations.